The Early Years Foundation Stage (EYFS) sets standards for the learning, development and care of children from birth to 5 years old. All schools and Ofsted-registered early years providers must follow the EYFS, including childminders, preschools, nurseries and school reception classes. The revised EYFS includes a requirement that to count in the staff:child ratios at level 3 staff who hold an Early Years Educator qualification must also hold a level 2 English and mathematics qualification. The revised EYFS also includes the new paediatric first aid (PFA) training requirements that were announced in July 2016 via the government response to the PFA consultation, including that all newly qualified entrants to the early years workforce with a level 2 or 3 qualification must also have either a full or emergency PFA certificate within 3 months of starting work. Following the Government’s response to the consultation on ‘The Regulation of Childcare’ published 13 February 2014, the EYFS statutory framework has been updated and will be in effect from 1 September 2014. The revisions reflect changes which apply to Section 3 on Safeguarding and Welfare. There have been no changes to the areas of learning and development, including the early learning goals. Learn about changes for out of school childcare providers in the General Childcare Register from September 2014 and the importance of building quality for children and parents. This document contains all the changes from the 2012 framework that apply to the new 2014 EYFS framework. Statutory framework on the EYFS to be used until 1 September 2014. Key EYFS documents are listed below. Existing and evolving additional resources developed with the early years sector to implement the EYFS framework can all be found on this website in EYFS guidance. The Early Years Foundation Stage (EYFS) Handbook contains important information for all early years professionals, local authorities and headteachers about assessing children’s attainment. Making accurate and reliable judgements about EYFS attainment. The Handbook should be used alongside the EYFS Assessment and reporting arrangements and exemplification materials. The EYFS Profile LA moderation requirements booklet has been incorporated into section 6 of the 2014 Handbook. These materials are a selection of example evidence of children’s attainment, categorised into the 17 early learning goals (ELGs) which are part of the EYFS Profile. The downloadable materials establish the national standard for the level of learning and development expected at the end of EYFS for each ELG. Other stakeholders who wish to evaluate children’s learning and development. This document is a non-statutory guide to support practitioners and inspectors to help understanding of child development through the early years. It can be used by childminders, nurseries and others, such as Ofsted, throughout the early years as a guide to making best-fit judgements about whether a child is showing typical development for their age, may be at risk of delay or is ahead for their age. It is a guide to typical development while recognising that children develop at their own rates and in their own ways. This non-statutory guidance has been produced by National Children’s Bureau and supports you in implementing the statutory progress check at age two as required in the EYFS Framework 2012/14. The progress check has been introduced to enable earlier identification of development needs so that any additional support can be put into place as early as possible. The EYFS Framework does not require the progress check to be completed in a prescribed or standard format. It only specifies that information about a child’s development should be provided to parents in the prime areas of learning and development of the EYFS: personal, social and emotional development; physical development; and communication and language. This ‘know how guide‘ provides you with information to support you in carrying out the progress check and gives examples of how practitioners provide information to parents. Its aim is to stimulate ideas for how practitioners might approach the progress check. It is widely recognised the vital role that parents have in supporting their children’s learning and development. Parents need to know what to expect in relation to their child’s development through the different age bands of the EYFS. What to expect, when? is a simple guide which takes parents through the expectations of each age band in the EYFS and how they can support their children’s learning and development. This latest addition to the EYFS suite of materials is available to download as a free pdf. Download What to expect, when? 4Children has published a non-statutory document, developed with parents for parents providing an overview of the EYFS Framework 2012. It illustrates how parents can support their child during their foundation years. Settings can add further information in the blank boxes provided to give parents more detail about the implementation of the EYFS in their setting. It is the intention that all settings should share this guidance with parents. You can access, tailor and share the the document with parents electronically but also as a downloadable printed copy. There is an accompanying user guide taking you through the process of editing the Parents’ Guide. In April 2012, a revised EYFS Framework was issued by government based on the recommendations of Dame Claire Tickell’s review, The Early Years: Foundations for Life, Health and Learning. Along with four specific areas of learning: literacy; mathematics; expressive arts and design; and understanding the world. To adhere to a clearer set of requirements to keep children safe. This non-statutory guidance was produced by Early Education and is a resource to support you in implementing the statutory requirements – learning and development of the EYFS Framework 2012/14. It replaces Appendix 2 of the 2008 EYFS Practice Guidance. This guidance shows how the four themes of the EYFS Framework and the principles that inform them work together to support babies and children. The Unique Child develops and learns through interaction in Positive Relationships and Enabling Environments. It illustrates how the Characteristics of Effective Early Learning may be supported and extended by adults as well as how they underpin the Prime and Specific Areas of Learning and Development. Use Development Matters as part of your daily observation, assessment and planning. It can also be used at points during the EYFS as a guide to making best-fit summative judgements, with parents and colleagues across agencies, about whether a child is showing typical development, may be at risk of delay or is ahead for their age. The age/stage bands are the same as they were previously. They overlap because these are not fixed age boundaries but suggest a typical range of development. When you use Development Matters it is important to remember that babies and young children develop at their own rates and in their own ways.The development statements and their order are not necessary steps for every child and should not be used as checklists. 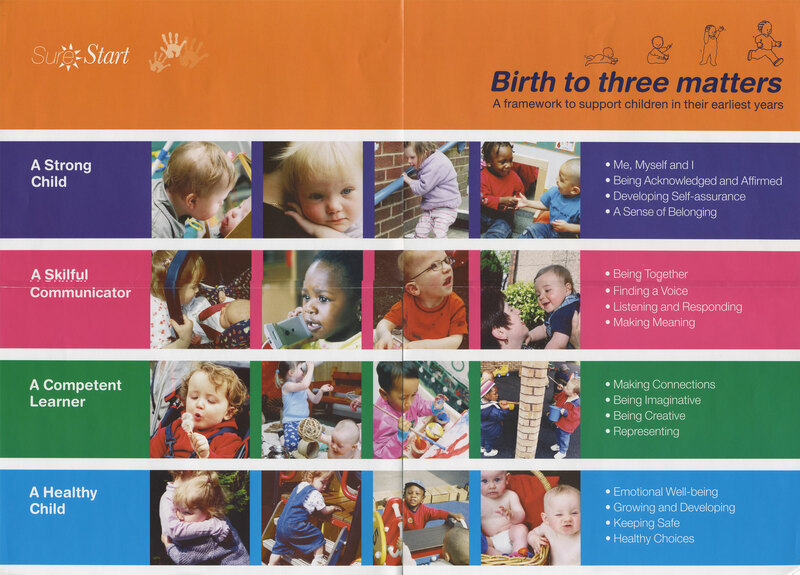 The Foundation Years team converted the booklet, poster and the cards from the Birth to Three Matters packs into PDFs for practitioners to download to support you in your work with the youngest children. Downloads of the original statutory framework and supporting materials are available for archive reference only: Statutory Framework, Practice Guidance, EYFS wall posters, Principles into Practice cards. This EYFS pack does not reflect current policy. This information has been a life saver thank you so much I can now use this as part of my job application. Thank you for the information and booklets, very useful. EYFS Forum – The Foundation Stage Forum was set up in 2003, to provide support for practitioners and other professionals involved in the Foundation Stage of education. Pre-school Learning Alliance (PSLA) – The Pre-school Learning Alliance is a leading early years membership organisation and one of the largest providers of quality childcare in England. PACEY – is the Professional Association for Childcare and Early Years. A standard-setting organisation, they promote best practice and support childcare professionals to deliver high standards of care and learning. National Day Nurseries Association (NDNA) – NDNA is the national charity and membership association specifically for nurseries, providing nursery support, information and advice, childcare training and a quality improvement scheme, e-Quality Counts. Family and Childcare Trust – aims to make the UK a better place for families, through research, campaigning and information provision, and working with government, employers and parents to reduce pressures on family life. National Education Trust – an independent charitable foundation dedicated to the promotion and sharing of excellent practice and innovation in education. Early Education – promotes the right of all children to education of the highest quality; providing support, advice and information on best practice for everyone concerned with the education and care of young children from birth to 8.